I work to jobs ( daytime and nighttime) because my goal is to save as much money I can and to something more productive in my life. to be more specific, to do something on my own. But the bad salary earnings and a loan my mother has, leaves me almost empty pockets. 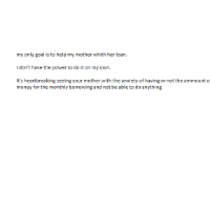 My first goal is to help my mother pay her loan and then starting save the money I need. This is where your contribution would be a gift to end the loan stress me and my mother have and eventually start something good.